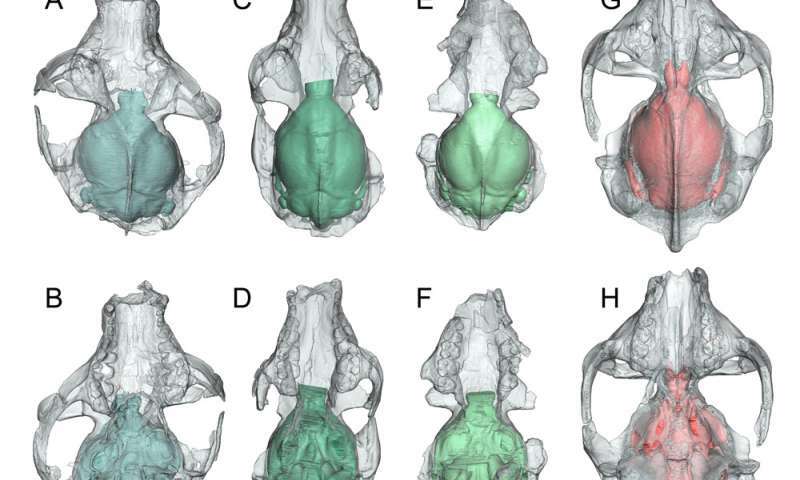 Virtual brains reconstructed from ancient, kiwi-sized primate skulls could help resolve one of the most intriguing evolutionary mysteries: how modern primates developed large brains. University of Florida paleontologists found clues in the remarkably preserved skulls of adapiforms, lemur-like primates that scurried around the tropical forests of Wyoming about 50 million years ago. Thought to be a link between primitive and advanced primates, their fossil skulls were the best evidence available for understanding the neuroanatomy of the earliest ancestors of modern primates. But there was just one problem—the brain cavities of the fragile skulls contained only rock and dust. That is, until Arianna Harrington, then a UF undergraduate student and later a master's student at the Florida Museum of Natural History on the UF campus, used CT technology to create the first virtual 3-D brain casts of the early primates. The eight virtually reconstructed and dissected brains—the most ever created for a single study—show an evolutionary burst including improved vision and more complex neurological function preceded an increase in brain size, said Harrington, now a Duke University doctoral student. Details of the findings are described online in the Journal of Human Evolution. "It may be that these early specializations allowed primate brains to expand later in time," said Harrington, the study's lead author. "The idea is that any patterns we find in primate brain evolution could lead to a better understanding of the early evolution that led to the human brain." Scientists have long debated whether primates have always had big brains compared to body size, or if this was a trait that appeared later. The new study's findings are consistent with previous endocast studies of Australopithecus afarensis, the oldest hominid known, and Victoriapithecus macinnesi, an early Old World monkey, which showed brain size increase followed brain specialization in early hominids and monkeys. Adapiforms, which are not directly related to humans, evolved after the earliest primate ancestors, called plesiadapiforms, which lived about 65 million years ago. Harrington and colleagues created virtual endocasts for three different species of adapiforms: Notharctus tenebrosus and Smilodectes gracilis from the middle Eocene Bridger formation of Wyoming and a late Eocene European specimen named Adapis parisiensis. Adapiforms' skulls differ from the earlier plesiadapiforms in a few ways including having more forward-facing eyes. Thanks to the new virtual endocasts, scientists were able to take a closer look at anatomical features which revealed that, while adapiforms placed relatively less emphasis on smell more similar to modern primate brains, the relative brain size was not so different from that of plesiadapiforms, said study co-author Jonathan Bloch, curator of vertebrate paleontology at the Florida Museum. "While it's true humans and other modern primates have very large brains, that story started down at the base of our group," Bloch said. "As our study shows, the earliest primates actually had relatively small brains. So they didn't start out with large brains and maintain them." "It is likely this indicates they're beginning to rely more on vision than smell," she said. "Scientists have hypothesized that vision may have helped early primates forage in complex arboreal forest systems." From a lot of the comments I have read on here, their brains have just swollen from being vain. I have never seen so many people that think they're smart that that contribute so little. Other than telling everyone else how smart they are. 1. How did life arise from the ground via purely physical and chemical processes all by itself? 2. How did the fantastic self-made life develop multicellularity? 3. How did life survive, i.e. how did it feed before going extinct? 4. How did it figure out to develop skin? 5. How did it figure out to develop bones? 6. How did it figure out to develop eyes? 7. How did it figure out to develop ears, nose, mouth, teeth, limbs, tail etc.? 8. How did it figure out to develop a brain with which to control those items? 9. How did it figure out an immune system? 10. How did it figure out a repair system? No, it's NOT "evolution did it". That's the god of the gaps talking - there is no concrete supporting evidence that these things "evolved". It's just a humanist/materialist's pipe dream. "Scientists have hypothesized that vision may have helped early primates forage in complex arboreal forest systems." Of course it did, how else would the critters feed themselves? It needs to be demonstrated that a vision system like the biological eye can arise from purely random biological (read mutation, genetic flow, drift, duplication and natural selection) processes. It should be interesting to see how a system that can detect a single photon at 36.x degrees Celsius can arise all by itself compared to all the millions of dollars intelligent humans have to spend to develop a deep cooled sensor system as large as a human body just to detect a single photon. Claiming that "evolution did it" is beyond absurd, given the physics and chemistry involved. If "evolution did it" then "evolution" is way beyond genius in its capabilities, so much so that one should begin to question the definition that says "evolution" does not DESIGN anything. Claiming that "evolution did it" is beyond absurd, "evolution" does not DESIGN anything. Fred this is not the 1950's we have come a long way, answers are at your fingertips and evolution does not have anything to do with your sky daddy existing or not existing, that has to do with human ego's. We have seen evolution in our lifetimes. Evolution isn't your everyday switch to light button! It's way more complex and damn, since the beginning of the Universe, it had plenty of time to design itself as we see (and have yet to understand) now. Just because you're unable to accept you can't understand such complexity doesn't mean it doesn't exist. Don't make your lack of imagination and curiosity a justification to give up on discoveries for everyone! @FJ: "A lot more conundrums to solve ...". But those 'conundrums' don't touch how modern primates evolved large brains. Moreover, questions 2-10 has been solved by biology (evolution), and question 1 is independent of the others as soon as we have life - and obviously we have. You can google up Q2-10. And if you don't know that life exists inside and outside your mother's cellar where you seem to hide, I am afraid no one can help you.